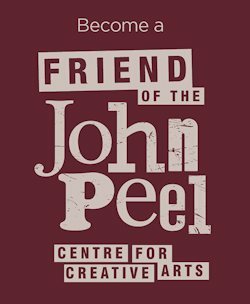 The John Peel Centre for Creative Arts is located on Church Walk in Stowmarket, Suffolk. We welcome people with disabilities and provide good disabled access. From the market square in Stowmarket head towards the Buttermarket, the alley-way that runs alongside the TSB Bank. Walk through the Buttermarket towards the Church of St Peter & St Mary. Turn right onto Church Walk; the Centre is located about 50 yards along on the right hand side. From Stowmarket railway station, exit the station through the main station entrance on platform 2, heading through the car park towards Station Road. Walk up towards the traffic lights (the Volkswagen dealership to your left), you will see the church spire of St Peter & St Mary ahead of you. Cross at the traffic lights and turn left into Church Walk. Follow Church Walk, passing the Library on your left. The Centre is straight in front of you. By road – Stowmarket sits on the A14. From the West exit the A14 at junction 49 and follow the signs towards the town centre. From the East exit the A14 at junction 50 and follow the signs to the town centre. By train – Stowmarket is on the main Norwich to London Liverpool Street train route (via Colchester and Chelmsford), as well as the route to/from Cambridge and Ipswich. Stowmarket station is just a five minute walk from the centre. By air – The nearest airport to Stowmarket is Norwich International Airport, 25 miles to the north of the town. Cambridge airport is 35 miles to the west whilst London Stanstead is just over 60 miles south-west of the town. 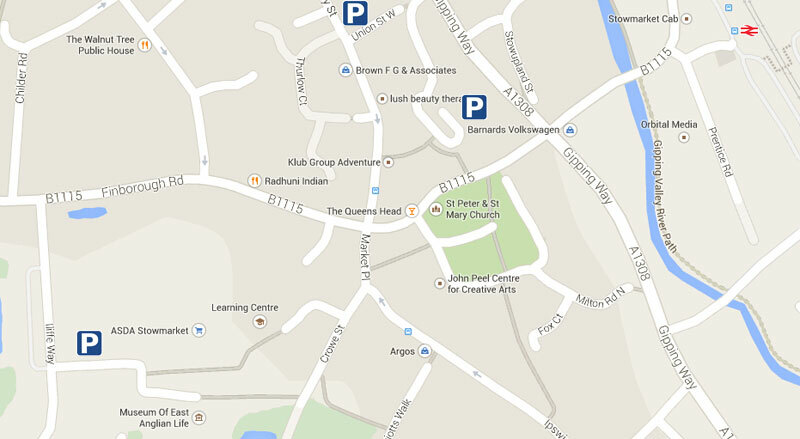 There are a number of public and supermarket car parks close to the centre. The nearest being Family Bargains car park, less than five minutes away. There are also car parks at Asda (Iliffe Way), B&M (Milton Road), and council car parks on Union Street West and Ipswich Street. All of these car parks are free after 6pm. Street parking close to the Centre is limited and we do not recommend it.